In our daily lives, we often forget about how our actions and decisions affect our pets. We continue to hold these habits in hopes that our pets won't mind at all. For example, fireworks are a big issue for many pets – the level of noise and strange sounds can make the 4th of July into the 7th level of Hell for a sensitive pet. Is it really possible to help your pet adjust to such a stressful event? When your pet’s stress level is managed, its ability to handle the emotional rigors of everyday life increases. Your awareness of stress signals, knowledge of the cumulative nature of stress, and having strategies in place to manage stress contribute significantly to your pet’s ability to handle high stress situations. So what is it that your pet finds stressful? Let them tell you. Now one yawn does not a stressed animal make. However, a yawn accompanied by lip-licking and the whites of the eyes showing could point to a dog that is experiencing growing levels of stress. A normally friendly cat who is meowing and refusing to be touched might be anxious. Pet stress, just like human stress, is cumulative. Someone who flips out when they get home to find that the trash hasn't been taken out may actually be stressed about work. A pet suffering from severe anxiety at the prospect of a car trip may actually be on the brink because someone made them go to a fireworks show the night before. Eventually, if enough stress accumulates, your pet will pass its stress threshold. This is akin to a nervous breakdown in a human. This is also the culprit behind many a bite or scratch triggered by seemingly innocuous behavior on the part of the victim. The simple solution to cumulative stress is to reduce sources of stress in your pet's life if at all possible. Grooming with Scaredy Cut replacing your electric clipper - a major stressor for a noise/vibration-sensitive pet - is just one thing you can do. This may mean not taking them on some trips or keeping them with you when you feel that time apart from you will be too much for them. You are irreplaceable in your pet's life and the best solution to their anxiety. As your pet's protector and most trusted companion, You are what will allow them to manage stress most effectively. This means staying by their side sometimes when it may be more convenient to drop them off somewhere. Being your pet's protector reinforces your position as the safe place in their life. Pets with a strong bond of trust with their owners can better handle stress and are more likely to respond to desensitization training. There are many ways to desensitize a pet that involve easy lifestyle changes that naturally teach the pet to behave in a certain way. Even cats can have their behavior modified in positive, life-changing ways. Don't subject your pet to it when possible! 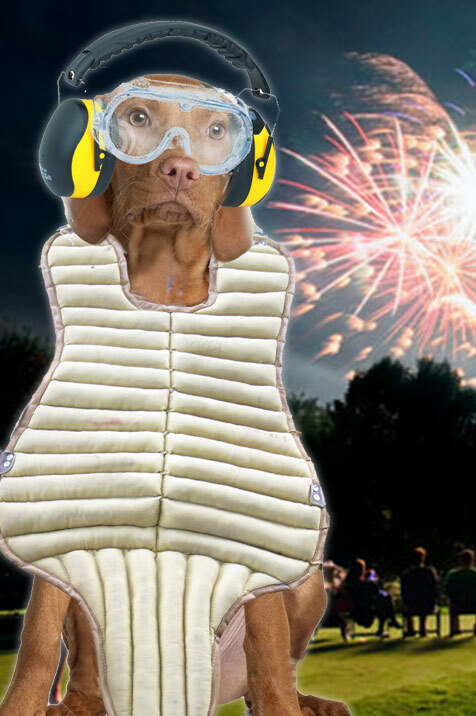 Follow that simple rule and when it's not possible to avoid a stressful situation, like your neighbor's fireworks spectacular, your pet will be far more capable of taking things in stride. Have something to say? Write us a comment!